The Department of Neurological Surgery offers a sub-internship that is open to Weill Cornell Medical College students and visiting students in their third and fourth years of medical school. The purpose of this elective is to acquaint students with a wide range of neurosurgical diseases that are treated at NewYork-Presbyterian/Weill Cornell Medical Center and Memorial Sloan-Kettering Cancer Center. By becoming integral members of the neurosurgical service, students will improve their history and physical examination skills, learn the basics of post-operative patient management, and acquire basic operative techniques. They will participate in teaching conferences, morning rounds, inpatient and outpatient consultations, and overnight call. The majority of their time will be spent assisting in the operating room. The students will become closely acquainted with our residents and faculty physicians during this elective and function as members of the neurological surgery team. At the end of the rotation, the students will be expected to make a brief grand rounds presentation on the topic of their choice. 1. 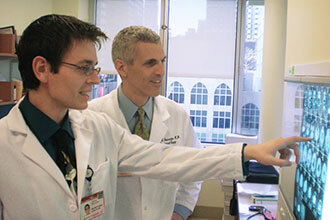 Please follow the directions for Visiting Medical Students at Weill Cornell Medical College. 2. Please submit your CV in the same packet with the application forms. 3. Please submit an online application to MSKCC. Include an official school transcript. Students should indicate on their online application that they are applying for the combined Weill Cornell/MSKCC elective in Neurosurgery; however they do not need to submit a second application fee. Once your application is approved, you will be notified by the Office of Academic Affairs of Weill Cornell Medical College of final approval and will receive an e-mail detailing where to report on the first day of the rotation. The e-mail will also include instructions for paging the Chief Resident, as well as how to obtain scrubs and a Weill Cornell ID.